Looking for a INFINITI Q40 sedan smart remote for your new car? 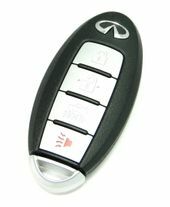 Purchase your replacement Infiniti Q40 Remote smart key fobs from us and save huge. Great selection of OEM Infiniti Q 40 proximity remotes, transponder keys, remote transmitter colorful rubber covers and accessories at discount prices.